"O blessed vision! Happy child! For what may be thy lot in future years." Imladris is always beautiful in high summer, made more so by Lord Elrond's careful modulation of the climate to remain always within the comfort ranges of the residents. Still, some days the weather escapes the master's control, as is only to be expected. Elrond's attention is constantly demanded elsewhere, so that it is easier for him to let the sun and the wind do as they will for a time. The seasons pass, and Elrond often contents himself with making sure that nature's intended boundaries hold with only a few variations for the sake of Elven comfort, compliments of the ring of power he wields and the arcane knowledge he holds. Therefore, the wind in Rivendell is forever gentle, ensuring that the rain and snow fall outside the windows of the Last Homely House. Leaves spin mischievously into chamber corners to add ambiance rather than mess, and the Bruinen never floods its banks. Nonetheless, some summer days are overheated and humid. Like today. Today saw young Legolas formally settled into his new home here at Imladris. Arwen and the other elven maidens attending her have fussed overmuch, I fear, but the outcome is that better fitting clothing has been obtained for my little leaf. I've also requested a bigger bed for my chambers, which have also become Legolas's to share with me. Elrond had made previous arrangements to clear another chamber so that my elf might have some small space of his own, but Legolas refused this generosity and prefers to stay with me. I am glad of this, for I do not dare leave him alone nor out of my sight just yet. Not even here in this formidable sanctuary, for Legolas is yet tender and small and vulnerable to dangers unknown and unforeseen. I will have to leave him to the watchcare of others far too soon as it is when I resume my travels on behalf of Middle-earth. When that day arrives, I will have little use for my rooms in Elrond's humble house. Legolas then might find some comfort within the walls that contained our companionship. Our time together is newly begun, and already I mourn the separations I know are coming. But that is for another day. For now, it is a muggy, overheated August day in Lord Elrond's library. Legolas is sitting in one of the chairs before the cold fireplace with a plate of honey bread and a small mug of milk balanced precariously on his lap. His front teeth are absent, and so he must hold his slice of bread at an angle, the better to gnaw on it with less useful incisors. Nibbling carefully, he does not notice the honey flowing to the far side of the bread and down his wrist. Legolas discovers the oversight as I watch and hastily licks at it. While he manages to remove the sticky substance from his skin, he also succeeds in getting it in his hair. It is hard to suppress a smile, but Legolas casts a slant-wise glance my way to gauge my reaction, and I know that I must not smile. Or perhaps I should, as the child's expression says that he fears the escaping honey is some sort of failing on his part. Legolas, I'm learning, worries endlessly. I do smile then, but in reassurance rather than humor, as his latest fear has flattened the amusement I felt. Seated at his desk, Lord Elrond has no such reservations and snorts with amusement; already he is fond of the child. Legolas peers at him through shaggy bangs, no doubt assessing the danger a great Elven lord might pose. My elf's sudden shift of attention from me to Lord Elrond brings sticky strands of hair against his face, so that the honey now clings to his cheeks. But now I note that not only the honey causes his hair to cling so closely. Legolas's hair sticks wetly to his forehead and to the back of his neck in the early afternoon. He looks hot and messy, damp and uncomfortable. Only last night, Elrond and I gave the waifling a bath and discovered that his tangled mane was blond rather than dirty brown. This morning, the discoveries continue for the shining mane seems to have a life of its own, burying the child beneath a disordered mop. "He needs a haircut," I say softly. "From the look of things, he's needed a haircut for a great many weeks," Elrond says. "No doubt his minders avoided or ignored the inevitable. More evidence of their neglect, no doubt." I sigh. I could probably manage to trim Legolas's bangs, perhaps even lop off some of that long hair in the back. But there are other things to consider -- mainly the great hairmats that are visible even from across the room. "I have never cut a child's hair," I admit, "and he is such a little boy." "I would offer to do it for you, but my last experience with such things was not pleasant." I arch an eyebrow, encouraging Elrond to share the tale. He glances toward Legolas and back to me, then down to the table in embarrassment. "I tried cutting Arwen's hair shortly after she learned to walk," the confession begins. "Celebrian had left shortly before then, and so Arwen was at my mercy. It was a nightmare. I tried to restrain her to at least attempt a proper job of it, but that resulted in Arwen's screaming and thrashing about as though I intended her bodily harm. I ended up sitting on the floor in her room with scissors in hand, waiting for her to come close enough for me to snip madly at her hair before she dashed off again. She wandered about for weeks afterward, looking like a sheep shorn by a drunken hobbit. She received much sympathy for her appearance, while every mother in Imladris either laughed at me or sniffed in distain over my lack of parenting skills. Arwen took some time to grow out my disastrous efforts, which is no doubt why she is determined to cut her hair so seldom now." I sigh again. "I suppose this means that I should not count on your aid in trimming Legolas's hair?" "That is exactly what it means. Still, I can provide these... remnants from the past." Rummaging about in his desk, Elrond comes up with a pair of wicked-looking shears that look very much like they were designed to shear sheep. I quickly spirit them out of sight in one of my deep, voluminous pockets and hope that I do not manage to stab myself in the thigh before completing the mission to come. "Elrond, surely your efforts with Arwen have given you more experience that I've had," I protest. I know all too well how desperate I sound and care not at all to be begging. "I know nothing of small elfings and even less of trimming hair. As you can see, I can't even manage to keep my own beard even." The smile Elrond offers me is positively evil. "You have taken on the role of your elf's guardian and caregiver. It should be a simple thing for a wizard to tend a slight Elven child's hair. If you cannot, how are you to tend his other, far greater needs?" "Unlike you, I am childless -- totally inexperienced at such things." "As was I when I started caring for my children. As are many other parental guardians before we begin. You think that elves are born knowing how to raise children? It's as much a learning adventure for us as it will be for you. And I do believe that it's time for your lessons to begin, oh great wizard." I scowl, and rise from my chair, eager not so much to face the task at hand but to escape my companon's pithy comments and unrequested sharing of unpleasant wisdom. "You are showing a singular lack of sympathy for my situation, Lord Elrond." "You volunteered for the job, not me. I do wish you all luck, and hope to hear all about it when the screaming stops." I wince inwardly and hope it would not come to that. "Will you at least order a comb and brush and a pitcher of water be brought to a secluded corner of your garden?" "What, you're not attempting the surgery in your quarters?" "The light is stronger out of doors," I point out. "I want to be able to see what I am doing." "I should think you'd prefer the smaller area. If he bolts at least you'll have half a chance of capturing him again." "I have no intention of overpowering him to see this done. He's been forced through too much as it is. Either he agrees, or he does not. Secondly, I'd rather have our quarters remain a sanctuary rather than have them tainted with potentially bad memories." "For someone unprepared, you seem to have this quite carefully thought out," Elrond observes with his usual dry humor. He then nods in agreement, though whether this regards the decisions I've made or my requests, I do not know. "You will have the things that you require." I thank him. Grudgingly, as I still wish he'd do this for me. Crossing to the fireplace, I take the now-empty plate and mug that have been abandoned by Legolas in the corner of the chair. He sits with his legs straight out before him and a picturebook braced between his small hands. He turns the pages carefully, and I notice that there are no sticky honey stains there. He must have licked his fingers clean. Only clean hands touch books, we'd told him. He is a careful child, attentive and trying to be obedient in the only way he can see to be so. Still, while the hands are clean, the rest of him is a sticky mess. "Did you get enough to eat?" I ask when he looks up at me. A nod. His blue eyes are far calmer this morning than they were back in Mirkwood. Brushing the bangs from his eyes, I am happy to see that the shadows beneath them have faded somewhat as well. Kneeling beside the chair, I ask, "Will you come with me, little leaf?" I am careful to make it a question and not an order. Another nod and he sets the book aside. I hold my arms wide in silent invitation and am delighted when he gets up onto his knees and winds his arms around my neck in instant acceptance. Legolas little resembles the frightened waif I'd found behind the tapestry now, so quickly has he come to trust me. He would likely follow me anywhere I asked this day; I hate the thought that I might wreck his trust in only a few minutes. Departing the library, I carry Legolas down the broad stone stairway leading to the central floor of the house and out the back way into Lord Elrond's private garden. Not many elves are in the corridors, but those we pass seem to have heard about the new resident in Imladris. Eager for a look at the child, they greet us and peer at my little elf with ill-disguised curiosity. It is too much for the wary little one, and he buries his face against my neck, hiding from the eyes that follow us. Poor child, it is just too much too soon, and definitely more than this shy little one can bear. We reach the entrance to the garden, and I step into the peaceful green realm with a sigh of relief. Jiggling the child in my arms, I whisper into his ear. "Legolas, look." He squirms and burrows closer, clearly not eager to face the world he finds himself in. Freeing one arm, I stroke my hand down his hair in what I hope is reassurance. "It's safe now, Legolas. We're alone. Open your eyes and see where we are," I urge. "There are trees here." He reappears from the depths of my beard in a hurry, his blue eyes wide, and makes a small sound of surprise to see the forest-thick plethora of trees and plants growing on the edges of the narrow path. "Treeths," comes the soft, awe-filled comment. Satisfied that Legolas is on firmer emotional footing once more, I head on down the path toward our destination. He turns eagerly to see the trees as we travel. Reaching out, he grabs at a passing branch and laughs as it caresses his face. That laughter simultaneously lightens my heart and increases my guilt for the assault I am planning at the end of this path. The assault can wait, I decide instantly. Let him enjoy the moment. I lift him up to a branch, but he wriggles even harder so that I am forced to bend down and set him on the path. The moment his feet touch ground, he is off and running. Darting ahead of me, he gives a shout of pure joy and runs around the corner, out of sight. I respond as every panicky parent has from the dawn of time -- I hike up my robes and take off after him. Rounding the corner, I catch sight of Legolas's little bottom disappearing beneath a tangle of delicate ferns growing close to the ground. There is a long, tense moment as I triy to spy him among the greenery, but my elf has vanished. He isn't gone for long. He pops to his feet a short distance away and whirls to find me with his eyes, perhaps making certain I haven't gotten lost. A broad grin covers his face as the dirt covers his cheeks. Spinning about once more, he jumps and catches a low-hanging branch, swings to encourage momentum, and then throws a leg over to pull himself upright. From there, it is a simple thing for Legolas to climb ever higher. It is a wonderful sight, seeing him happy. I am not happy, however. My elf vanishs in the leaves even faster than he had in the ferns. And he couldn't fall from the ferns, whereas he's gained quite a respectable height in the branches. Legolas is so small and the fall so long and the ground so hard. I don't like this at all. And my elf reappears once more. Evidently he will circle back to me rather than keep going -- something that is reassuring to discover. Legolas finds a bigger branch, one that has grown out over our pathway. Scuttling down it on his bottom, he meets me halfway and snags my beard as I approach. My hands slide around his waist and pull him into a secure embrace as though I've been doing this since his first day in a tree. "So, you like Lord Elrond's garden?" I rumble. "Yeth!" I've never heard such enthusiasm from him before. "Then we must come here often." "It'th Lord Elwond's garden? All of it?" "It is his private garden. No one comes here but Lord Elrond and his guests." "Then we sthay out," Legolas says emphatically. "We have his permission to come here, little leaf. You are welcome here." "He won't mind?" comes the careful query. "Elrond is very generous. He won't mind sharing with you anytime you wish to come here." "Treeth..." He sighs, as though the green was restoring something sorely missed. His eyes are bright and his smile does not fade. His hands moved constantly to touch every leaf within reach. Sometimes he turns in my arms, so that his hand caresses my cheek or forehead in his quest to connect with the green life calling so strongly to him. The change in him is remarkable: is this truly the child I met in Mirkwood? The one who skulked in the shadows and was afraid to so much as breathe? Thranduil and his minions had done their best to trap this child in walls of stone. Only now did I realize how much my little elf needed the touch of tree and leaf and living things. Not to mention a bit of food, reassurance and a few hugs. Spiriting him away from the darkness of Mirkwood and bringing him here, to a place of growing life, light, and sanctuary had definitely been the right thing to do. We make our way slowly through the garden's twists and turns, finally coming up on the secluded alcove that Elrond had shown me months before. Here grows a canopy of ivy in shade that is provided by very old, very proud trees. It is here that I plan to give Legolas his first hair-cut. Elrond's servants have preceded us: the items I requested resided on a small round table to the right of a garden bench. Setting Legolas on his feet once more, I arrange the items, dampen the comb in the jug of water, and ponder how first to proceed. He stands quietly at my side -- too quietly, I soon discovered, for when I look down at him, I see that his eyes have gone wide with alarm to see the implements spread out on the table before us. Going down on one knee, I gesture at the comb and brush. "Will you let me untangle your hair?" He takes a step back from me, then seems to reconsider. Clenching his fingers into fists, he straightens his back and nods. Hesitantly. Granting reluctant permission. It is clear to me that someone has messed with his hair before, and I hesitate to ask what they did. Perhaps it is best to find my own way, to reassure my elf through gentle touches that this will not hurt? He trusts me, I chant silently to myself. He knows I will not hurt him. He trusts me. It will be well. How I hoped that would be proven true. I back up and sit on the bench, pull the table near, and pat my lap. Offering my most reassuring smile, I suggest, "Why don't you come over here?" His expression solemn, Legolas slowly closes the distance between us. Setting him on my thigh, facing me, I pick up the comb and start where the tangles are least, at his bangs. His hair is straight and fine, as smooth as the finest cloth turned out by Elven hands. In the sunlight it glistens like washed gold. Neither his father or his brother have hair like this, and I find myself wondering after the elven lady who had given him life. Who had she been? Thranduil had never spoken of her, and I know instinctively that Legolas does not remember her. I ruffle his bangs and they fall willingly in a jagged line. I smooth them with my hand and Legolas seems to lessen his grip on the robes covering my leg. "Just a few minutes, my leaf, and we'll be done." I know almost immediately that I spoke too soon. Moving back from Legolas's bangs, I encounter a thick mat of hair that absorbs the teeth of my comb and acts as a stiff wall to halt my best efforts. Legolas lets out a screech and yanks away as I pull, which only serves to increase the pressure and no doubt his pain. I let go the comb immediately. It sticks in place, effectively trapped by the mat of hair. Hugging those narrow shoulders, I apologize at once. "Hush, little one. I didn't mean to hurt you. Some of these tangles are downright wicked." Carefully removing the comb, I don't miss the accusatory blue eye glaring at me. I let my fingers explore his hair more extensively then, only to discern where companion mats are and to grow alarmed at what I find. One mat has formed into what is clearly an old, determined core behind his ear. There are heavy mats against the back of his neck, old and formidable, and there is something that looks like a wind mat residing near the crown of his head. These are the major ones, and his golden strands hid other, smaller ones. Our washing last night may have freed Legolas of dirt, but it set those tangles into even tighter knots that defy any implement of grooming to unseat them. In short, this is hopeless. "Legolas, this won't do at all," I murmur. "Most of these mats are so thick, we may have to cut them out." Letting out another screech, Legolas locks both hands in his hair. He spares me one panicked look before leaping off of my lap and pelting with all speed down the path leading away from our sanctuary. "Where are you going?" I call after him, letting the bewilderment I feel reflect in my voice. Skidding to a halt, he turns to glare back at me. The glare seems to fade into bewilderment the moment he realizes that I'm not to pursue him. He does not, however, walk back to come any closer to me. "NO." He growls the word, sounding like a kitten too harshly provoked. "You do not wish me to cut your hair?" "NO!" he shouts angrily, hands still locked protectively around the unruly strands. "You don't wish to be dry and cool?" I venture. Adamant, he shakes his head. "Did someone else cut your hair at home?" "Caerthan," Legolas informs me angrily. His stance is openly defensive. Caerthan, I gather, did not do a good job. "Why didn't you like how she cut it?" "Cut it ALL off!" Legolas spits. His little spine is rigid, his fingers are curled into outraged fists beside each ear. I rock back on the bench in surprise as the picture becomes clearer. Placing my hands on my knees, I hazard a guess. "Let me see... I would say that your hair was probably matted then as it is now, and Caerthan hadn't the patience to coax out the mats. Am I right?" "NO CUT IT!" he yelled again. It is the most noise I have ever heard him make. I wince at the shout, however, knowing the sound is probably wafting through the trees and straight up to Elrond's library windows. I can imagine his amusement, and it irritates me. "I promise that we won't cut it all off, Legolas. We may, however, have to cut through some it -- that is, cut through the mats in order to remove them as they're quite wrapped around all of your hair. But we will not cut it all off, only the hard bits." He regards me warily in the sunlight, half-wanting to believe me and half-refusing to do so. More reassurances are obviously needed. "Legolas, I'm not sure you'll understand, but I couldn't bear to cut off all of your hair, even if it were necessary, which it is not." I let him ponder that for a moment, not even certain he was old enough to understand what I was trying to say. He'd showed comprehension far beyond his years before, perhaps he will again. "Why not cut it?" He latches onto that, as I had hoped he might. "To cut it all off would hurt us both too much." He scowls in confusion. "How? How would it hurt you?" "Your hair is very handsome and very much a part of you. Like Lord Glorfindel's." I know that Glorfindel made a great impression on Legolas earlier that morning, when he'd complimented my leaf on his small, carved horse, and then invited him into the stables to see where his mare was being kept. Glorfindel had accepted my elf then, and I'd seen the hero worship bloom in Legolas's eyes in that moment. Glorfindel seemed rather taken with my little waif as well, which was a startling reaction, but a very welcome one. Legolas could not have a more perfect, stronger ally in Imladris. "I have hair like his?" Legolas said. "You do, indeed. We will take good care of it, my little leaf. But first we must comb it out. Glorfindel doesn't have mats in his hair." To cut Legolas' hair would be too great a loss, yet another violoation of this child's beauty. I can't explain it to him in these terms; I hope that the words I'd found are enough to convince him. Remembering the scissors in my pocket, I think it wise to reveal now that I have them, while Legolas was meters away from me rather than back on my lap. To hide them longer might be interpreted as a betrayal. Taking them slowly from my pocket, I set them carefully on the table. The metallic click as they touch the stone seems menacing to me, as does their size. I hope that Legolas doesn't see them that way, but there is nothing to be done for it now. "We will need to trim your bangs and separate the mats behind them so that we can comb them out," I explain further. "You won't need to swipe at your hair so much after that, and you'll be much cooler. Just as your mare is after her mane is pulled. Her mane lies neatly, and so would yours. The hair would stay out of your face then. Would you like that?" He considers my words for a very long time, lowers his head and stares at me through the protective curtain of his bangs as though to assess whether he really dares to trust me or not. 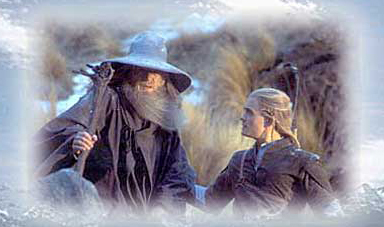 I all but hold my breath, wondering what can be done if Legolas decides that no, he won't trust me. "Awwight," he finally says, but he doesn’t look happy about it. "Then come over here and let's get started." I make a silent promise that he will not regret the risk I know he feels he is taking. He eyes the scissors all the way on his journey back down the path. He lets me lift him back onto my lap -- this time on the other thigh, the one closest to the table with its implements of torture. It is best to keep one's enemies in sight, after all. Reaching out, he pokes a finger at the massive shears, sending them sliding across the stone. He then looks up at me, and his worried eyes beg for reassurance. "Won't cut it all off?" "No, Legolas. I promise that I will not. Only what is truly necessary. Here, let me show you." I reach out and pick up the shears in one hand while carefully separating the mat behind his right ear from the surrounding hair. "Here, I'm only going to make one snip here. Just one. In fact, why don't you do it." I capture one small hand and wrapp it around the shears over my fingers, then line up the blades over the chosen lump of hair. "Now squeeze. Just close the blades." His fingers try to make the scissors comply, but it takes a bit of effort from my larger hand as well -- in fact, a surprising amount of force is needed. The slender mat falls free to slither down Legolas's shoulder and into his lap. I set the shears aside, pick up the tightly felted strands of hair and drape them across my palm. "Look at this, Legolas. This is what those hard places are in your hair. This is what they look like." He bends to study the mat closely and rubs it between his fingers. Clearly he has no idea what those things in his hair look like. I offer him the comb. "Here. Comb it out." He gives the mat a couple of tentative scrapes, then twists to look up at me in dismay. "Won't work," he says quietly. "No, won't work. It would take hours and hours even if we did try to untangle them, and it would hurt you a great deal, I fear. And this is only a tiny one," I add, setting the mat aside on the table. Legolas looks downcast as he processes this bit of information. I wrap an arm around the skinny shoulders and pull him against my chest in a reassuring hug. He nod when I release him, as if some important inner decision has been made. Folding his hands in his lap, he shivers and waits for me to begin. Exactly how committed is this little one? I decide to test him by reaching first for the scissors. His eyes follow my hand, but he still sits very still. Still holding the scissors, I pick up the comb and dampen it once more. "I'm going to wet your bangs and trim them." My hand wavers over his forehead. "Want long hairs. Like Elwond's." I ponder that for a moment. "You want your hair to grow longer, so we can pull it back like Lord Elwon--" I catch myself. "Like Elrond's?" It seems the elflord has also impressed himself upon the child. "We can do this." I set down the scissors. "Legolas, I will be gentle but parts of this may hurt. Tell me when it does, and I will try to be even more gentle." He sighs, but does not protest. Pain is nothing new to this little one, and his quiet acceptance of pain inflicted by the hands of adults makes my heart ache. It will not come from my hands, I swore silently. Never my hands. And so the real work begins, the painstaking, time-consuming work of separating the mats from his hair, carefully preserving every free hair possible, and cutting them lengthwise, only to slowly coax them free of the new, cleaner hair. In no time at all the ground at my feet is littered with Legolas hair-kitties -- bits of fluff that chase one another around in the summer breeze. Legolas sits stiffly, suspiciously through it all and eyes every bit of fallen fluff as if he is inspecting it. Does he even realize that they're not real hair any longer, but worthless fuzzy discards that can't possibly be of any use except to tighten against his scalp and come to hurt even more if they remain? Slowly, oh so slowly, the mats are conquered and the silver-gold hair prevails. I feel Legolas relax against me, probably in unison with me as the last mat -- the massive one at the nape of his neck -- is removed. It falls with a soft thump on the grass behind us, and I am glad to bid it farewell, after the frightening care required to snip it free strand by strand, praying that I didn't nick Legolas's scalp in the process. It was an evil mat, clearly ranking in seniority over the other newcomers. I reward myself by sliding my fingers upward through the now silky, free-flowing curtain, enjoying the feel of the individual strands slide through my fingers. Picking up the scissors once more, I smile and say, "Like Lord Elrond's, yes?" I encourage him to slide off my thigh and turn him to stand very still before me. Wetting his hair, I comb through it and cut only a few millimeters off of the back, preparing it to grow out before evening the silken fall into a neat curtain of hair. The tiny trimmed bits disappear in the collection of mats on the ground. More is needed, I know. Not more cutting, but something more needs to be done with those bangs. They are perpetually in Legolas's eyes, but he wants to grow them out and they need secured with... something. My elf turns as I lift the hem of my robe and watches in trusting bewilderment as I tug on a series of threads and then yank to free them. He accepts the threads solemnly, clutching them tightly between his fingers as I brush his hair and pull it back. Gathering the strands of bangs and other hair, I braid it all somewhat tightly above his forehead, letting the excess fall freely to rejoin the rest of his hair. At my request, Legolas surrenders the threads to let me to secure the results. Sitting back, I consider my work. He wiggles his eyebrows experimentally, then shakes his head. "Alright, then. I believe we're done." "No more cutting?" He sounds disbelieving. He startles me when he launches himself between my legs to throw his arms around my waist. My hand caresses his hair reflexively as he buries his face against me. "Legolas?" "No cutting," he reiterates, only this time I think it is an expression of gratitude rather than a request. "Does it feel cooler, on your neck? Not as heavy around your ears?" I ask. I indulge myself by letting my fingers slide through the incredibly soft hair at the nape of his neck once again. "Yeth." He doesn't let go of me, and I feel a sudden twinge of regret. All too soon, my duties will call me back into the wilds of Middle-earth; I will have to continue gathering information against Sauron while my little leaf stays safe here in Imladris, under the watchcare of others. I'd only had him in my care a few days. How can it cause such heartache to think of letting him go? One day, Legolas will begin a warrior's lessons and perhaps be taught at Elledan and Elrohir's capable hands. My little leaf will learn to kill orcs then, to run with the Rangers, and his innocence will end forever. I know that such lessons are necessary for him to survive, but I still wish it were not so. Eventually, I think that he must return to Mirkwood and commit himself to serving his father. I can only hope that by then King Thranduil will have healed and can realize what a precious gift he has in this beautiful, golden-haired son. I tighten my embrace, and try not to admit thoughts of past and future harsh treatment at the king's hands. I will miss Legolas once he has grown and my guardianship has ended. I am missing him already, and we met only days before, have years to go before he is grown. Right now, my leaf's little world is confined to Rivendell, and I can keep him safe. Adventures will come in the form of exploring his new home, in finding new trees to climb and make friends with, in discovering a universe of books in Elrond's library. Legolas will know only kindness living here; no one will hurt him again as his own father has, but one day he will leave these protective borders. And then, I will no longer be able to protect him. Eventually he will make friends and pursue interests of his own choosing. A life path will come in time to carry him far beyond my protective embrace. Eventually, I will lose him forever. But for now he is my little elf. His hair is mine to cut and to braid, and I can introduce him to the sanctuary that will cradle him so completely and protectively for the next fifty years. I cannot always be with him over those years, but I can carry him now to new trees, I can watch as he climbs them and let him leap into my arms, knowing that he has come to trust that I will always catch him. I can watch Legolas learn and explore and see the world as new again through his eyes, through what small bit of innocence is left him. That bit of child in him I will fight to protect, to preserve for as long as is possible. Starting now. His hair now looking like a proper Elfling's, Legolas and I leave Elrond's garden. With my new and depressing thoughts, I reward us both with a special delight to all children; I take him down to the river's edge, to turn over the flat rocks and show him what waterbugs lived beneath. Squatting down, he watches the bugs, chases them through the water with small fingers. I watch him and desperately try to commit every second to memory, seeing all of Middle-earth contained in this child, both made all the more precious to me for that. It will not always be so; one day, my elf will be full grown and run gracefully and silently through that grass, will guard the borders of his lands and leave me far behind. But not today. By the Valar, not today. I catch him up in my arms, savoring the sheer joy of holding him close and feeling that small, slight body relax against me in contentment and trust, smell the sun-warmed grass as we walk and the bird's-nest scent that is unique to all little boys' hair. This is a moment I must remember, even if all of my other memories fade. I left my books and my desk in the late afternoon to stretch my legs and my back, to drive the kinks from them as I prepared for the next meeting of the White Council. Legolas and Mithrandir had been gone a terribly long time, and I wondered how the hair-cutting ordeal had been resolved. I'd heard one or two shrieks of terror from the direction of my garden; hopefully no ears had been lost, no bloodshed had occurred. Perhaps Mithrandir had simply given up the task as too difficult and they gone on to other amusements. Perhaps the child had bolted as I had predicted he would, and Mithrandir was still searching for his lost charge. In any case, the two of them were nowhere to be found. They returned with the dusk, when the sun was a fiery ball sinking over the cliffs guarding our glen. I was lighting candles in the gathering gloom when Mithrandir returned to my library, carrying Legolas on his hip and pausing at the corner of my desk. Neither looked overly traumatized, I noted, nor was the child anywhere near bald. "Here now, set your jar down so that Lord Elrond can see what you've got." In his arms Mithrandir held a little boy I'd never seen before. I smiled, and he smiled back at me. "And who is this small person?" I said, slowly approaching the pair. "He's wearing Legolas's tunic and his brown boots. And there is indeed something familiar about that smile that has no front teeth, but you have a forehead and eyebrows where Legolas had none this afternoon. And are those ears I see?" "And is that your hair?" I was truly surprised to see the magic the wizard had wrought. In place of a matted, jagged tangle was hair that was neat and shiny and wonderful to behold. Legolas smiled and struggled to be put down, pointing shyly at the corner of the library. The wizard seemed to understand this silent request and gently set him down. The moment Legolas's feet hit the floor, he ran for the chair he'd vacated that morning. Climbing into it, he picked up the picturebook that had waited patiently all day for his return. He hesitated only long enough for a brief scrutiny of his fingers and a quick wipe off down his tunic. I watched him clamber up into the chair, then turned back to Mithrandir. "You are truly a great wizard," I admitted. "Legolas looks the proper Elven child now." "I did my best. And it may interest you to know that he wanted his bangs cut not at all. He wants them grown out and pulled back, like yours." I laughed out loud. "None of my own children ever wanted that." "Well, Legolas does. It seems you've made quite an impression on him." More flattered than I was willing to admit, I turned to my desk and indicated the jar that Legolas had deposited on its corner. "And what is this?" "The caterpillars are beginning to weave their cocoons," the wizard explained. "Legolas was concerned that these few have shut themselves away so soon, so that they might not make it through the winter. He wanted us to bring them inside, so that they might sleep safely through the winter and emerge unscathed within your home next spring." Reaching into a hidden pocket in his robe, Mithrandir produced a handful of bruised wildflowers which he deposited in a pile on my desk. "And here is their breakfast. He doesn't want them to go hungry." Startled by the compassion evident in so young a child, I glanced over to the rescuer of butterflies where he sat absorbed by his picturebook, and then turned the jar in the candlelight, peering inside for a glimpse of the opalescent cocoons. "Of course they are welcome to stay here," I murmured, almost as an afterthought. Mithrandir chuckled. "Remember that next Spring, when the snow is still teasing outside and you are batting butterflies from your path indoors." "But I like butterflies. So, apparently, does Legolas." That fact pleased me for some strange reason. For the rest of the evening, Legolas seemed actually happy, freed as he had been from that unruly mop of hair. I could not take my eyes off of him; he was still the thin, fragile child I'd met the night before, and yet at the same time he was someone altogether new. A child who was almost... normal in his reactions to the world around him. He shyly showed me his jar after Mithrandir pried him from his picturebook. He ate his first meal in the Great Hall, seated in Mithrandir's lap. It is true that Legolas's eyes went wide with alarm to see the other Elves of his newly adopted community come and go. Some paused at our table to meet our newest resident and to exchange greetings with his guardian, who was always made welcome at our table. The bards began playing shortly before Legolas finished his meal, and the child paused and stared. He looked entranced by the musicians, as though it was all magical and all somehow beyond his imaginings, though he still turned away from questioning eyes of others in the hall if he noticed them staring at him. "Why is he so enthralled by all of this?" I asked finally. "Surely this is all familiar to him from Thranduil's own hall?" "Legolas wasn't allowed in Thranduil's own hall," Mithrandir revealed. "Not even to peer in from the doorway. That is actually how we met," he confided, stroking the child's shining hair as though to soothe again the hurt from that time. "Legolas crept up to the great hall to see who I was, and Thranduil caught him peeking through the hinges." Mithrandir's expression darkened, completing the tale when his words trailed off into displeased silence, while I was struck anew at the alienation and neglect the child had experienced. There were certain things all Elves were accustomed to; Legolas, it seemed, had been deprived of all of them. Well, that was to be no more, if I could help him. And I could. Legolas was leaning back against Mithrandir's chest and fighting sleep now, obviously wanting to watch the singing and the dancing, to linger just a little longer in his new home, cradled in the comforting arms of his benefactor. "There will be other nights and much more music, my little leaf," murmured the wizard, resting his chin atop Legolas's head. "Sleep now." "You made it through one of the first rough steps in childrearing and you're both still intact," I commented softly as Legolas lost the battle and fell into sleep. His mouth dropped open slightly, his blue eyes glazed over, cheek resting against Mithrandir's shoulder and one hand buried tightly in his beard. "Yes." Sighing with pleasure, the wizard held his elf closer, buried his nose in his charge's clean scalp, and breathed deeply. He stretched Legolas more comfortably across his lap as Glorfindel slipped into place next to them and smiled at the sleeping child. "I realized this afternoon that my leaf's growing up is inevitable. I am most grateful to have the two of you so willing to help me." Glorfindel arched an eyebrow. "What exactly have I agreed to help with?" "Raising Legolas," I informed him. "Mithrandir survived the boy's first hair-cut and is waxing philosophical." "Oh? And what is next?" "Next?" Mithrandir chuckled. "I don't want to know what's next quite yet. For this moment, Legolas is still my little leaf. I want to savor the moment."